Playfulness of the Otter is chapter two of What Animals Can Teach Us about Spirituality and illustrates the importance of hard work, relaxation, and play. In addition to taking a close look at our rapport with others, this chapter explores the inner child, physical desires, and persistence. 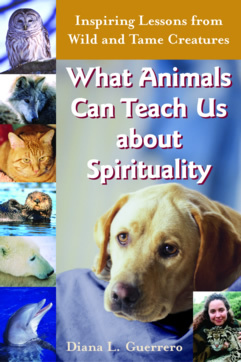 We'll look at control, judgments, emotions, creativity, and the energy behind choices, guided by a menagerie of canines, marine mammals, a horse, and a cat. "Martin trained dolphins under contract for the United States Navy. In the program, the dolphins accompanied the trainer's boat out into the open ocean, where they engaged in various studies that examined their capacities and sensitivities to the environment, such as sound pollution from boats, oil rigs, and related equipment. Martin and I regularly discussed the challenges of animal training in both the captive environment and the open ocean, and we compared notes while challenging each other to be more innovative and insightful with our charges. Through these discussions we brainstormed solutions to behavioral problems. Although some of Martin's projects were confidential, without revealing any secrets, he asked me my opinion about his sessions, inviting me to share how I might have handled difficult situations he encountered. One such discussion involved a female dolphin with whom he shared a great working relationship. He treated all his trainees with fairness, but he struggled with his attachment to how this dolphin should perform. He did not allow for any variations or idiosyncrasies. Adherence to standards in animal training is important, but animals experience good days and bad days, too. As Martin described his interactions with the dolphin during his sessions in the open ocean, he began to pontificate..."